When an act of desperation leads to a demonic deal, one man must pay the price of his arrogance. The Horsemen are being assembled - renewed and renamed. 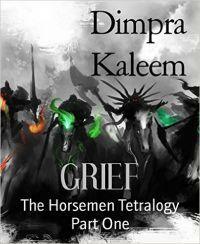 Grief, Fury, Hatred and Lust. "My hand went over my mouth. I really was compelled to read it and was sorry that it ended. This is one of those stories, that you don't want to end"
"I am extremely happy to find that there are still authors out there who can write spell binding prose and tell significant stories. Dimpra is certainly near the top of that list if not on top of it. Wonderful"